Last Thursday, President Mahinda Rajapaksa invited a team of visiting British parliamentarians for a breakfast meeting. When the visitors were invited to have breakfast, one of them explained very politely as most Britons do, that he had a rather uneasy stomach. Hence, he said he would not partake in the spread on offer. Rajapaksa who spoke with him realised that Sri Lankan cuisine was too hot or spicy for many foreigners. He offered something that he took whenever he had an ‘uneasy stomach’.They were two small guliyas (ayurvedic pills) made of ground ginger and honey. “If it’s good for you, I am sure it would be good for me too,” declared the MP as he swallowed Rajapaksa’s guliya. ” Aney nehe janadipathithuma. Api mey gedara daanayak denawa.(No,no!! Mr. President, there is an alms giving at home)” Abeywardene responded. “Oya ithin apita horen dana denawa..apita kiuweth nehe (You are offering alms without even inviting us, aren’t you)” Rajapaksa seemed to complain. On the following day, Rajapaksa took time off to drop in at Abeywardene’s new home to join the alms giving. “Pinkama nisa api me dawaswala mas malu kanne nehe. Obathumata elawalui bathui thamai kanna wenne. Kamak ne neda? (We are refraining from meat and fish these days. So, Mr. President you may have to be content with a vegetarian meal. Would you mind, Sir? )” Abeywardene asked.Rajapaksa, readily agreed to a hearty veggie lunch. Justice Minister Rauff Hakeem and Sri Lanka Muslim Congress senior member Nizam Kariapper were among those who received post-graduate degrees at the University of Colombo’s annual convocation held last Tuesday at the BMICH. Both Hakeem and Kariapper received their Masters in Law (LL.M) degree. In what seemed unusual, Minister Hakeem sat with several other graduates who were accommodated in rows of chairs. There were no ministerial security men around. �Since it is the holy month of Ramazan, Hakeem and Kariapper had come prepared with dates in their pockets. When it came to break fast time, they ate them. After receiving their degrees, they went back to their seats again to wait till the ceremonies were over. A group of some forty Veddahs (indigenous people) were in for disappointment at the Kandy Perehera. They had taken their seats to watch the historic event when they were told to vacate. The group led by Sri Lanka’s Veddah community leader Vanniya had come to Kandy from their traditional homestead in Dambana to offer “honey puja” (donation of honey) to the ‘Temple of the Tooth’. This was an annual and age-old custom that had been followed by them to honour the historic event. According to Vanniya, they are given seats to watch the Perahera once they conclude their ritual. However, this time their seats went to some VIPs from the government. The group of Veddahs decided to return to Dambana without watching the Perahera being very critical of the organisers for insulting them. On Friday, the Mahanayake of the Asgiriya Chapter severely reprimanded the Diyawadana Nilame’s staff for insulting the native people and told the Diyawadana Nilame to go and apologise to the native leader for this serious offence. FILE PHOTO: Jayalath Jayawardena, MP with his sirens during the 2004 tsunami. He is flanked by A. Thiagaraja, then LTTE co-ordinator for NGOs and LTTE spokesman Daya Master. On his right are three German volunteers. He earned the sobriquet of being an ‘alarmist’ during the separatist war. This was for handing out sirens to villages that faced Tiger guerrilla dominated territory. He even handed some to the guerrillas soon after the 2004 tsunami. Now that the war is over, the UNP Gampaha District Parliamentarian has not given up the sirens that can alarm a village. He is now presenting sirens to temples so that they could alert the surrounding villages when treasure hunters make forays. A Police team from a station not so far from the City conducted a raid on a brothel run by a film actor.�However, Police circles are now buzzing with reports on the outcome of the raid. Some claim that the actor moved heaven and earth to keep the issue under wraps. Others say he knew the right man to approach and thus had his way. The Himalayan kingdom of Bhutan, like Sri Lanka, is a member of the South Asian Association for Regional Co-operation (SAARC). The landlocked Bhutan has won praise from animal rights groups this week. Its Minister of Agriculture and Forests has decreed that any female domesticated chicken, turkey, duck, goose, or guinea fowl kept for the purpose of egg production, including pullets, shall never be continually confined in restrictive cages that prevent them from fully stretching their limbs or expressing important natural behaviours. The order also mandates that birds shall have sufficient space to be able to perch or sit quietly without repeated disturbance. Typically, egg factory farms around the world cram billions of egg-laying hens into barren cages so small that the birds can’t even spread their wings. Each bird has less space than a sheet of paper on which to spend her entire life. Such extreme confinement prevents them from expressing many important natural behaviour such as perching, nesting or dust bathing, says the Humane Society International. Incidentally, Bhutan’s Prime Minister Jigmi Y. Thinley is the president of the Maha Bodhi Society of India. A lesser known facet of President Mahinda Rajapaksa’s life came to light when he flew on a specially chartered SriLankan Airlines flight from Colombo to Cuba with a stopover in Durban. He spends most of his time during long flights watching movies. It is Parliamentarian Sajin de Vass Gunawardena, monitoring MP for the Ministry of External Affairs, who has a collection of them lined up in a portable video player. Whilst on the trip to Havana and return via Rio and Lisbon, other members of his entourage went to the rear of the aircraft for a sing song. Among the vocalists were Presidential Secretary Lalith Weeratunga and Minister Wimal Weerawansa. However, Rajapaksa sat in the modernised Business Class cabin to watch movies. 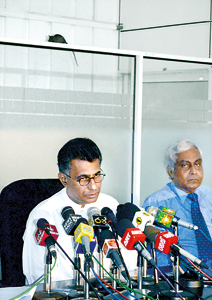 Education Minister Bandula Gunawardene and Higher Education Minister S.B. Dissanayake were participating in a television talk show on the controversial Z-score fiasco. �When there was an intermission to allow advertisements on TV screens, the presenter asked the two ministers who was older among them. “Meya podi ekaa. Mang campus eking out wenakota thamai meya campus awe. Mammai lokka (He is the little one. He entered university when I completed studies. I am older),” minister Dissanayake said. Both the ‘lokka’ and the disciple who followed are busy with their report to the Cabinet on the “Z” score having jointly and severally put the Government in a big soup. What better way to provide security for important events where local and foreign crowds mingle than to have your own security company, at least under someone else’s name. This is what a one-time top man in uniform tried to do. The move has been discovered and those who matter have ordered an immediate change. A powerful jammer was installed at the Welikade Prison last Friday to prevent the use of mobile phones by prisoners. More are to follow in other prisons. The move follows the discovery that more and more prisoners were using mobile phones. It came to light that even prisoners who fell in the “VIP” category, though not treated that way whilst serving their sentence, possessed mobile phones. The jammers were tested at the Welikada Prison earlier. However, the signal strength of mobile phones was too strong that the jammer could not cope with it. Now, a more powerful jammer has been put in place. During the second one day international cricket encounter between Sri Lanka and India at the Suriyawewa International Cricket stadium in Hambantota, players and officials had gathered for a buffet dinner.�A promising young Sri Lankan all-rounder was seen serving himself a pile of chicken on his plate. There were no other accompaniments. Later, he was seen leaving the dining area. Many thought he was searching for a comfortable place to have his dinner. Instead, he was seen going around the ground with the plate of chicken. He was offering the delicacy to a few stray dogs. The player also had gone to the pavilion to ensure that he had not missed out on any dog. A thrilled onlooker said what a kind hearted all-rounder he was. “He is kind hearted no doubt. But he is distributing other people’s chicken,” said his friend who had come along together to watch the match. Who should worry about a few pieces of chicken? There are many who are serving themselves liberally to the cricket gravy after all!